Video Assistance for Replacement Control Valve Gasket Installation To Repair BBQ Grill Gas Leaks. Although there are several different methods for a barbecue grill control valve to be installed into a gas barbeque grill, the connection we are concerned with today is the very common clamp-on connection. Inside the control panel of a gas BBQ is the gas manifold pipe connected to your fuel and each control valve clamps on to this manifold pipe to pull fuel from the manifold pipe into the grill burner. The manifold pipe has a small opening for the valve to slide into and a round o – ring gasket seals this opening so no fuel leaks from the control valve connection. Control valves that clamp onto manifold gas pipe have o-ring gasket to seal gas pressure. Shown here, the gasket is red and is installed just inside the rounded top section of the clamped section of this grey aluminum control valve. All lamp on valves have this same gasket; they are not usually red. As we can see in this image the manifold pipe installed across the barbecue grill control panel has a lot of discoloration which is almost always the case in every outdoor appliance. Over time the manifold will become dirty, rusty, corrosive even though it is not in the cooking area of the fire box. This can cause problems with the tight seal of the gasket or even when installing the valve as shown here. Make sure the manifold is clean because a single drop of grease or a bubble of rust-spotting can interrupt the gas seal. Install valve gasket so gasket curve matches rounded manifold pipe. The most common reason we will have to examine inside the control panel for fuel leaks at the control valve and valve gasket is heat from our BBQ. When a barbecue is cooking with the lid down heat is usually being vented at the back of the closed lid so there is a limit to how much heat can build up and stabilize at any time. Often when the back of the barbecue faces the ocean or any area that allows wind to blow at this back hood ventilation, the hottest part of convectional heat is unable to be pushed out of the grill. Heat will leak forward into the control panel where it is well known to damage ignition wiring, valve lubrication and these sealed gaskets. Remove and clean inside the valve for new gasket installation. Depending on how much heat has been pushed into the control panel area, a control valve stem, which connects to the knob, will eventually become sticky and “freeze” because of damage to the internal lubrication. The gasket allowing a very minute fuel leak is typically a more immediate problem. If the gasket is permitting fuel to leak. 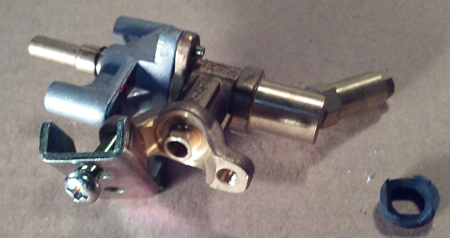 this can cause a typical LP tank’s safety features to become activated so the propane does not flow properly to the manifold but the bigger problem is if the fuel does flow and leaks inside the control panel while also feeding fuel through the manifold pipe, control valves, and into the barbecue grill burners. Obviously this is highly dangerous because we will ignite the BBQ and witness the burners as if all is functioning properly without seeing there is fuel flowing inside the control panel which will eventually ignite. Remove the gasket that has been damaged so the inside of the control valve clamp is clean and reinstall the new gasket so the curve of the gasket mirrors the curvature of the manifold valve. Always tighten Very Well and Always check for leaks! Need any assistance or have any questions, Contact Majestic Grill Parts. 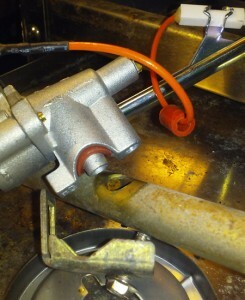 Previous post: Replace Extinct Turbo Challenger and STS Control Valve in BBQ Galore Barbecue Model. 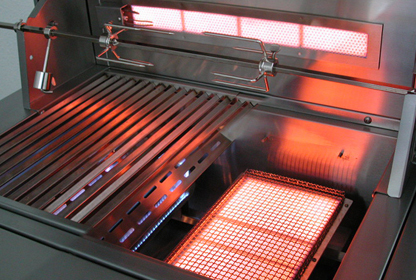 Next post: Replace Solaire Infrared And U Burner In All Gas Grill Model Repair.